I participated in an Influencer Activation Program on behalf of Mom Central Consulting for Huggies & Target. I received samples for this review and a promotional item to thank me for participating. I have to admit, I knew nothing of Huggies diapers before trying out the Little Snugglers. I should have looked into these sooner! I was very impressed! I particularly liked, what I called, the “blow-out guard” (more on that later). I purchased my Huggies Little Snugglers through Target.com. The shipping was quite quick and the diapers actually arrived before the rest of my order. The Little Snugglers come in sizes Preemie through size three. I purchased the size three for my little man. I’m a little sad that he is on the high end of the diaper sizes since it means that it won’t be long before he is growing out of them. However, I am enjoying them while he can wear them. They have a cottony-soft inside and out. On the inside, there are soft little clouds of softness that rest against your baby’s bum. Your child’s bum will feel like it is resting on clouds while they grow and learn new things. 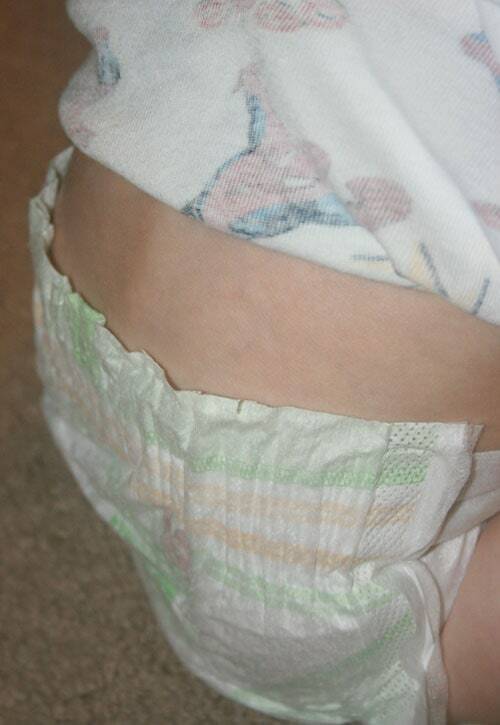 Wetness Indicator – There is a special line in the front of the diaper that shows yellow. When your child wets the diaper, the line turns blue. Umbilical Cord Cut-out – There is a little notch cut out of the front of the diaper to allow your child’s belly button to heal after birth. Flexible Pocketed Back Waistband – Now this is what I called the “Blow-Out Guard”. This waistband helps keep in the messes!! The back doesn’t gap like most diapers do. Stretchy SnugFit* Waistband – The waistband was very comfortable on my little man. He has acid reflux and I have always been careful about waistbands. These were comfortable for him to wear. The Huggies Little Snugglers truly fit like a hug – soft and strong. Soft enough for your baby’s comfort but strong enough to keep the messes in. As you can see in the photo below, the waistbands do a great job at not leaving a gap in the back. This is all due to the Flexible Pocketed Back Waistband – a clothing saver. Are you expecting?? Target has a great Baby Registry system. I remember using it 3 years ago when we were expecting with our oldest child. It was easy to create and add items. When you create your registry, don’t forget the diapers! They are so helpful when you bring your newborn home. Making diaper runs to the store may be last on your list to do when you get home. Huggies has created a Register Your Wish Sweepstakes. Simply add Huggies® Little Snugglers Diapers and Huggies Natural Care® Wipes to your registry and enter your wish in the sweepstakes and you could win diapers for a YEAR!! 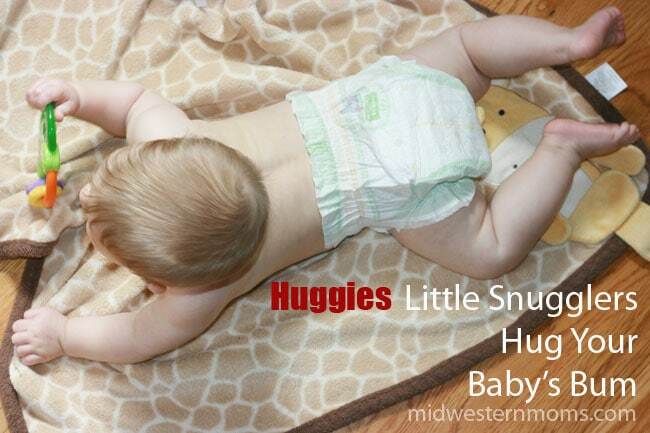 What are your favorite features of the Huggies Little Snugglers? I LOVE diapers with a wetness indicator! I don’t know what my husband would have done without them!